With Abandoned Gas Wells, States Are Left With The Cleanup Bill The bust of the coal-bed methane industry has left Wyoming responsible for the exorbitant cost of plugging thousands of wells. 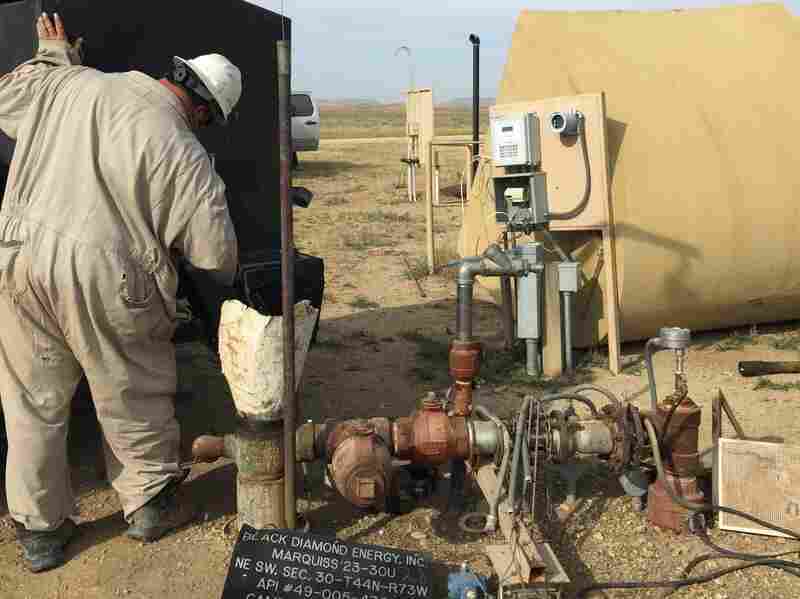 The price tag for dealing with deep oil and gas wells may be even higher. 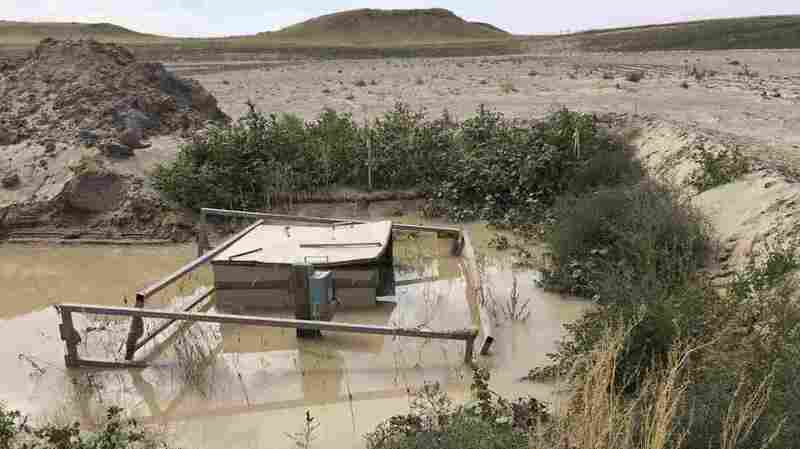 A coal-bed methane well sits abandoned in a pool of water outside Gillette, Wyo. It's more expensive than it looks to clean up. When energy booms go bust, the public is often left responsible for the cleanup. That's because while most states and the federal government make companies put up at least some money in advance to pay for any mess they leave behind, it's often not enough. After the methane industry collapse, there were almost 4,000 wells in Wyoming that the company responsible walked away from. Now, the state has to pay the price. Driving around the Powder River Basin in northeast Wyoming with Jeff Campbell and Jeff Gillum, both of whom work for the Wyoming Oil and Gas Conservation Commission, is like playing an extended game of "Where's Waldo?" Gillum and Campbell are in charge of making sure the abandoned wells get cleaned up and plugged. But first, Gillum says, they have to find them as they did recently near the town of Gillette. "Finding Waldo is easier!" Gillum says. That's because Gillette, like many other U.S. cities from Los Angeles to Denver, grew up around the wells. They're in people's front yards and at the end of the driving range at the golf course. They're everywhere. Workers begin the plugging process with bentonite, a kind of super absorbent clay that gets poured down the well to seal it. Once the bottom of the well is filled with bentonite, a cement crew comes in and then, a pipe cutting crew. Campbell says it takes 20 workers total and many hours from start to finish. "It's a lot more work than a lot of people realize," he says. And it also takes a lot of money. Coal-bed methane wells in Wyoming are relatively shallow, so they generally cost under $10,000 to plug apiece. But there are so many orphaned wells, it could cost up to $30 million over the next decade to clean them all up. Bentonite must be poured into abandoned coal-bed methane wells to seal off gas-producing formations. But that's only the first step of many. That's no small expense. But there's a potentially bigger one on the horizon: all the deep oil and gas wells that were recently drilled. "They're that much deeper, the pad sizes are much bigger, so the costs to properly plug and reclaim these deep oil wells are going to be much, much more expensive," says Jill Morrison, organizer with the Powder River Basin Resource Council. These deeper wells will cost tens of thousands of dollars each to clean up. Companies put up bonds to cover their cleanup costs in the event they go bankrupt. But the bonds they pay upfront are almost never enough. Right now, companies only have to pay $75,000 for all of their wells on private land in Wyoming. Mark Watson, the state's oil and gas supervisor, recently proposed rules that would double the required upfront amount to $150,000. "Some companies, it would be more than enough and some companies, it wouldn't be enough to plug all their wells," he says. Companies are supposed to pay a second bond when the wells stop producing, but historically that hasn't always happened. During the coal-bed methane boom, large companies sold their wells — and the responsibility for plugging them — to smaller companies that didn't post the second bond before going under. Watson says the new rule will help avoid a repeat of that situation. "One of the things that we probably need to do a better job at is identifying companies that aren't solvent, and identifying them sooner than we did when the coal-bed play ended," he says. But that's not easy. In the recent oil price crash, even some relatively big companies have gone bankrupt. There is a way to ensure there's enough money for cleanup: make companies pay for all of it upfront. But that's not on the table in Wyoming, or anywhere else in the country.